It is estimated that by the year 2050, virtually 80% of the world’s population will live in urban areas and the total global population will increase by approximately 3 billion people. An enormous amount of farmland may be required, conditional on the change in yield per hectare and sustainable practices implemented, to feed the growing population. Scientists around the world are concerned that this large amount of required land will not be available and that severe damage to the earth will be caused by the added farmland and the increase of impervious surfaces. If designed correctly utilizing sustainable principles, Vertical farms may eliminate the need to create additional farmland and help create a cleaner environment, by reducing the transportation of food to the mass population and reducing impervious cover. Vertical farming is a highly debated concept, one which proposes that it is economically and environmentally viable to cultivate plant or animal life within tall buildings (skyscrapers), purpose-built multi-level structures, or vertically inclined surfaces. The following short video, titled “Designing the Vertical Farm” demonstrates how vertical farming structures could be designed and functionally exist in our developing world. To learn more about sustainable development and vertical farms, John Cornacchia invites you to visit Globacorp Developments International at www.globacorp.com. The idea of a vertical farm has existed for nearly six decades and numerous built precedents are well documented by John Hix in his authoritative text “The Glass House”. The writing is a comprehensive survey of glasshouses, tracing the evolution of glass enclosures from the mid 16th century, when the desire to nurture exotic plants in often hostile climates led to the development of the glasshouse and the ingenious mechanical servicing systems, capable of creating their own artificial micro-climates. Through the technical advances in the early 19th century, large-scale structures were constructed, initially for private individuals and botanical societies. During the mid 19th century, with the advent of mass production and specialized component systems, the fashioning of modular structures became possible. 1) The first category of vertical farming was established, nearly a century ago, in 1915 by Gilbert Ellis Bailey, who also coined the phrase “vertical farming”. In his book “Vertical Farming”, Bailey defined the earliest meanings and methods of vertical farming as “the keynote of a new agriculture that has come to stay, for inexpensive explosives enable the farmer to farm deeper, to go down to increase area, and to secure larger crops. Instead of spreading out over more land he concentrates on less land and becomes an intensive rather than an extensive agriculturist, and soon learns that it is more profitable to double the depth of his fertile land than to double the area of his holdings, and he learns that his best aid and servant in this work is a good explosive. Peace congresses demand that swords be turned into pruning hooks. The farmer is busy turning explosives from war to agriculture, from death dealing to life giving work”. 2) The second category of vertical farming was defined by American ecologist Dr. Dickson Despommier, arguing that vertical farming is legitimate due to environmental reasons. He claims that the cultivation of plant and animal life within skyscrapers will produce less embedded energy and toxicity than plant and animal life produced on natural landscapes. He also claims that natural landscapes are too toxic for natural, agricultural production, despite the ecological and environmental costs of extracting materials to build skyscrapers for the simple purpose of agricultural production. According to Despommier, vertical farming thus discounts the value of natural landscape in exchange for the idea of “skyscraper as spaceship”. Plant and animal life are mass-produced within hermetically sealed, artificial environments that have little to do with the outside world. In this sense, they could be built anywhere regardless of the context. This is not advantageous to energy consumption, as the internal environment must be maintained to sustain life within the skyscraper. Despommier’s concept of “The Vertical Farm” emerged in 1999 at Columbia University. It promotes the mass cultivation of plant and animal life for commercial purposes in skyscrapers. Using advanced greenhouse technology such as hydroponics and aeroponics, the skyscrapers could theoretically produce fish, poultry, fruit and vegetables. While the concept of stacked agricultural production is not new, scholars claim that a commercial high-rise farm such as ‘The Vertical Farm’ has never been built, yet extensive photographic documentation and several relevant historical books suggest that research on the subject was not diligently pursued. New sources indicate that a tower hydroponicum existed in Armenia prior to 1951. Proponents argue that, by allowing traditional outdoor farms to revert to a natural state and reducing the energy costs needed to transport foods to consumers, vertical farms could significantly alleviate climate change produced by excess atmospheric carbon. Critics have noted that the costs of the additional energy needed for artificial lighting, heating and other vertical farming operations would exceed the benefit of the building’s close proximity to the areas of consumption. 3) The third category of vertical farming denotes the concepts proposed and built by architect Ken Yeang developed at least ten years prior to Despommier. Yeang proposes that instead of hermetically sealed mass produced agriculture structures, that plant life should be cultivated within open air, mixed-use skyscrapers for climate control and consumption (i.e. a personal or communal planting space as per the needs of the individual). This version of vertical farming is based upon personal or community use rather than the wholesale production and distribution of plant and animal life that aspires to feed an entire city. It therefore requires less of an initial investment than Despommier’s proposed vision. However, neither Despommier nor Yeang are the conceptual “originators”, nor is Yeang the inventor of vertical farming in skyscrapers. One of the earliest drawings of a tall structure that cultivates food for the purposes of consumption was published over a century ago in Life Magazine 1909. The published drawings feature vertically stacked homesteads set amongst a farming landscape. This proposal can be studied in “Delirious New York”, a 1978 publication authored by Rem Koolhaas, wherein he noted the 1909 theorem “The Skyscraper as Utopian device for the production of unlimited numbers of virgin sites on a metropolitan location”. Images of the vertical farms at the School of Gardeners in Langenlois, Austria, and the glass tower at the Vienna International Horticulture Exhibition, clearly illustrate that vertical farms exhausted more than 40 years prior to contemporary discourse on the subject. Although architectural precedents remain valuable, the technological precedents that make vertical farming possible can be traced back to horticultural history through the development of greenhouse and hydroponic technology. Early building types or hydroponicums where developed, integrating hydroponic technology into building systems. These horticultural building systems evolved from greenhouse technology, and essentially paved the way for the modern concept of the vertical farm. The British Interplanetary Society developed a hydroponicum for lunar conditions and other building prototypes where developed during the early days of space exploration. During this era of expansion and experimentation, the first Tower Hydroponic Units where developed in Armenia. The Armenian tower hydroponicums are the first built examples of a vertical farm which was documented by Sholto Douglas in decisive text “Hydroponics: The Bengal System” first published in 1951. Contemporary notions of vertical farming are predated by this early technology by more than 50 years. Contemporary precursors that have been published, or built, are Ken Yeang’s Bioclimatic Skyscraper (Menara Mesiniaga, built 1992); MVRDV’s PigCity, 2000; MVRDV’s Meta City/ Datatown (1998-2000); Pich-Aguilera’s Garden Towers (2001). 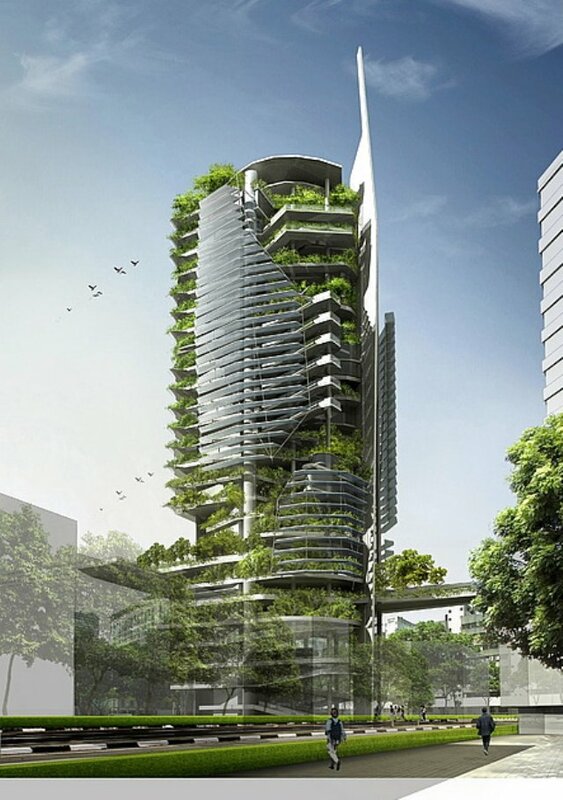 Ken Yeang is perhaps the most widely known architect that has promoted the idea of the mixed-use Bioclimatic Skyscraper, combining living units and opportunities for food production. Early prototypes of vertical farms, or ‘tower hydroponicums’ existed in Armenia prior to 1951 during an era of hydroponic and horticultural building system research fueled by space exploration and a transatlantic technology race. The latest version of these very ideas is Dickson Despommier’s “The Vertical Farm”. Dickson Despommier, a professor of environmental health sciences and microbiology at Columbia University in New York City, developed the idea of vertical farming in 1999 with graduate students in a medical ecology class. Despommier had originally challenged his class to feed the population of Manhattan (approximately 2 million people) using 5.3 hectares (53,000 m2) of usable rooftop gardens and green roofs. The class calculated that, by utilizing rooftop gardening methods, only 2 percent of the population would be fed. Unsatisfied with the results, Despommier made an impromptu suggestion of growing plants vertically indoors. The idea ignited interest among the students and gained significant momentum. By 2001 the first outline of a vertical farm was introduced and today scientists, architects, and investors worldwide are working together to make the concept of vertical farming a reality. In an interview with Miller-McCune.com, Despommier described how vertical farms would function, stating that “Each floor will have its own watering and nutrient monitoring systems. There will be sensors for every single plant that tracks how much and what kinds of nutrients the plant has absorbed. You’ll even have systems to monitor plant diseases by employing DNA chip technologies that detect the presence of plant pathogens by simply sampling the air and using snippets from various viral and bacterial infections. It’s very easy to do. Moreover, a gas chromatograph will tell us when to pick the plant by analyzing which flavonoids the produce contains. These flavonoids are what give the food the flavors you’re so fond of, particularly for more aromatic produce like tomatoes and peppers. These are all right-off-the-shelf technologies. The ability to construct a vertical farm exists now. We don’t have to make anything new”. Architectural designs have been produced by Chris Jacobs at United Future, Andrew Kranis at Columbia University, and Gordon Graff at the University of Waterloo. Mass media attention began with an article written in New York magazine. Since 2007, articles have appeared in The New York Times, U.S. News & World Report, Popular Science, Scientific American, and Maxim, among others, as well as radio and television features. Numerous potential advantages of vertical farming have been argued by Despommier, of which many of these benefits are obtained from scaling up hydroponic or aeroponic growing methods. Increased Crop Production – Unlike traditional farming in non-tropical areas, indoor farming can produce crops year-round. All-season farming multiplies the productivity of the farmed surface by a factor of 4 to 6 depending on the crop. With some crops, such as strawberries, the factor may be as high as 30. Furthermore, as the crops would be sold in the same infrastructures in which they are grown, they will not need to be transported between production and sale, resulting in less spoilage, infestation, and energy required than conventional farming encounters. Research has shown that 30% of harvested crops are wasted due to spoilage and infestation, though this number is much lower in developed nations. Additionally, freshness would be superior and the need for preservatives would be eliminated. Despommier suggests that, if dwarf versions of certain crops are used (e.g. dwarf wheat developed by NASA, which is smaller in size but richer in nutrients), year-round crops, and “stacker” plant holders are accounted for, a 30-story building with a 2 hectare (20,000 m2) footprint would yield a yearly crop analogous to that of 970 hectares (9,700,000 m2) of traditional farming. Climate Related Issues – Crops grown in traditional outdoor farming suffer from the often suboptimal, and sometimes extreme, nature of geological and meteorological events such as undesirable temperatures or rainfall amounts, monsoons, hailstorms, tornadoes, flooding, wildfires, and severe droughts. The protection of crops from weather is increasingly important as global climate change occurs. Due to three recent floods, which occurred in 1993, 2007, and 2008, the United States incurred billions of dollars in lost crops, with even more devastating losses to unrecoverable topsoil. Furthermore, Michael Pollan stated in his September 9, 2009 article titled “Big Food vs. Big Insurance” that it is expected that changes in rain patterns and temperatures could diminish India’s agricultural output by 30 percent by the end of the century. Because vertical farming provides a controlled environment, the productivity of vertical farms would be mostly independent of weather and protected from extreme weather events. Although the controlled environment of vertical farming negates most of these factors, earthquakes and tornadoes still pose threats to the proposed infrastructure, although this again depends on the location and construction of the vertical farms. Conservation of Resources – It is estimated that each unit of area in a vertical farm could allow up to 20 units of area of outdoor farmland to return to its natural state. Vertical farming would reduce the need for new farmland due to overpopulation, thus saving many natural resources currently threatened by deforestation or pollution. Deforestation and desertification caused by agricultural encroachment on natural biomes would be avoided. Because vertical farming lets crops be grown closer to consumers, it would substantially reduce the amount of fossil fuels currently used to transport and refrigerate farm produce. Producing food indoors reduces or eliminates conventional plowing, planting, and harvesting by farm machinery, also powered by fossil fuels. Burning less fossil fuel would reduce air pollution and the carbon dioxide emissions that cause climate change, as well as create healthier environments for humans and animals alike. Organic Crops – The controlled growing environment reduces the need for pesticides, primarily herbicides and fungicides. Advocates claim that producing organic crops in vertical farms is practical and the most likely production and marketing strategy. Reversing Mass Extinction – Withdrawing human activity from large areas of the Earth’s land surface may be necessary to slow and eventually reverse the current anthropogenic mass extinction of land animals. Traditional agriculture is highly disruptive to wild animal populations that live in and around farmland and many argue that it becomes unethical when there is a viable alternative. A study, referenced by the Third Congress of the European Society for Agricultural and Food Ethics, depicted that wood mouse populations dropped from 25 per hectare to 5 per hectare after harvest, estimating 10 animals are killed per hectare each year with conventional farming. In comparison, vertical farming would cause very little harm to wildlife. Human Health Hazards – Traditional farming is a hazardous occupation with particular risks that often take their toll on the health of human laborers. Such risks regularly include exposure to infectious diseases such as malaria and schistosomes, exposure to toxic chemicals commonly used as pesticides and fungicides, confrontations with dangerous wildlife such as poisonous snakes, and the severe injuries that can occur when using large industrial farming equipment. Whereas the traditional farming environment inevitably contains these risks (particularly in the farming practice known as “slash and burn”), vertical farming, due to a controlled and predictable environment, reduces some of these dangers. Additionally, the current American food system produces fast, unhealthy food inexpensively, while fresh produce is less available and more expensive, encouraging poor eating habits. These poor eating habits lead to health problems such as obesity, heart disease, and diabetes. Urban Growth – Vertical farming, used in conjunction with other technologies and socioeconomic practices, could allow cities to expand while remaining largely self-sufficient food wise. This would allow for large urban centers that could grow without destroying considerably larger areas of forest to provide food for their people. Moreover, the industry of vertical farming will provide employment to these expanding urban centers. This may help displace the unemployment created by the dismantling of traditional farms, as more farm laborers move to cities in search of work. Regardless of the efficiency of vertical farming, it is highly unlikely that traditional farms will become obsolete, as there are many crops that are not suited for vertical farming, and production costs are inherently much lower. Energy Production – A case study entitled “Landfill Power Generation” by H. Scott Matthews projected that vertical farms could utilize methane digesters to generate a small portion of its own electrical needs. Methane digesters could be built on site to transform the organic waste generated at the farm into biogas, which is generally composed of 65% methane along with other gasses. This biogas could then be burned to generate electricity for the greenhouse. Vertical farming relies on the use of various physical methods to become effective. Combining these technologies and devices in an integrated whole is necessary to make Vertical Farming a reality. Various methods are proposed and under research. The most common technologies suggested are greenhouses, aeroponics, hydroponics, aquaponics, composting, grow lighting systems, phytoremediation, and vertical construction. Since Despommier argues that the technology to construct vertical farms currently exists, he concludes that the system can be profitable and effective. Numerous developers and local governments in various cities have expressed serious interest in establishing a vertical farm. Some of the first cities on-board are Incheon (South Korea), Abu Dhabi (United Arab Emirates), Dubai (United Arab Emirates), Dongtan (China), Shanghai (China), Beijing (China), New York City (United States), Portland (United States), Los Angeles (United States), Las Vegas (United States), Seattle (United States), Surrey (Canada), Toronto (Canada), Paris (France), and Bangalore (India). In addition, the Illinois Institute of Technology is now establishing a detailed plan for Chicago. It is suggested that prototype versions of vertical farms should be created first, possibly at large universities interested in the research of vertical farms, in order to prevent failures such as the Biosphere 2 project in Oracle, Arizona. In 2010, the Green Zionist Alliance proposed a resolution at the 36th World Zionist Congress calling on Keren Kayemet L’Yisrael (Jewish National Fund in Israel) to develop vertical farms in Israel. The concept of vertical farming is not without great criticism. Opponents question the potential profitability of vertical farming. A detailed cost analysis of start-up costs, operation costs, and revenue has not been completed. Researcher Michael Bomford of Kentucky State University stated that the additional cost of lighting, heating, and powering the vertical farm may negate any of the cost benefits received by the decrease in transportation expenses. The economic and environmental benefits of vertical farming rest partly on the concept of minimizing food miles, the distance that food travels from farm to consumer. However, a recent analysis suggests that transportation is only a minor contributor to the economic and environmental costs of supplying food to urban populations. The author of the report, University of Toronto professor Pierre Desrochers, concluded, “food miles are, at best, a marketing fad”. Similarly, if the power needs of the vertical farm are met by fossil fuels, the environmental effect may be a net loss. Even building low-carbon capacity to power the farms may not make as much sense as simply leaving the traditional farms in place, and burning less coal. During the growing season, the sun shines on a vertical surface at an extreme angle such that much less light is available to crops than when they are planted on flat land. Therefore, supplemental light would be required in order to obtain economically viable yields. Bruce Bugbee, a crop physiologist at Utah State University, believes that the power demands of vertical farming will be too expensive and uncompetitive with traditional farms using only free natural light. The scientist and anti-global warming activist George Monbiot calculated that the cost of providing enough supplementary light to grow the grain for a single loaf would be almost US$10. Since the vertical farm proposes a controlled environment, heating and cooling costs will be at least as costly as any other tower. But there also remains the issue of complicated, if not more expensive, plumbing and elevator systems to distribute food and water throughout. Even throughout the northern continental United States, while heating with relatively cheap fossil fuels, the annual heating cost can be over US$200,000 per hectare. Regular greenhouse produce is known to create more greenhouse gases than field produce, largely due to higher energy use per kilogram of produce. With vertical farms requiring much greater energy per kilogram of produce over regular greenhouses, mainly through increased lighting, the amount of pollution created will be much higher than that from field produce. As plants acquire nearly all their carbon from the atmosphere, greenhouse growers commonly supplement CO2 levels to 3-4 times the rate normally found in the atmosphere. This increase in CO2 which has been shown to increase photosynthesis rates by 50%, contributes to the higher yields expected in vertical farming. It is not uncommon to find greenhouses burning fossil fuels purely for this purpose, as other CO2 sources, such as furnaces, contain pollutants such as sulphur dioxide and ethylene which significantly damage plants. This means a vertical farm will require a CO2 source, most likely from combustion, even if the rest of the farm is powered by ‘green’ energy. Also, through necessary ventilation, much CO2 will be leaked into the city’s atmosphere. Greenhouse growers commonly exploit photoperiodism in plants to control whether the plants are in a vegetative or reproductive stage. As part of this control, growers will have the lights on past sunset and before sunrise or periodically throughout the night. Since existing single story greenhouses already pose a nuisance to neighbours because of light pollution, surely a 30 story vertical farm in a densely populated area will face problems because of its light pollution. Hydroponics greenhouses regularly change the water, meaning there is a large quantity of water containing fertilizers and pesticides that must be disposed of. While solutions are currently being worked on, the most common method of simply spreading the mixture over a sufficient area of neighbouring farmland or wetlands would be more difficult for an urban vertical farm. Lastly, the increased initial building costs are expected to be much greater than that of a regular commercial or residential vertical structure, although sufficient is not available for analysis until a vertical farm has been designed and engineered in final state. Regardless of the diverse opinions and theories, vertical farming undoubtedly relies on the use of various physical methods and sustainable processes to become effective. Combining these varying technologies, devices, and sustainable processes in an integrated whole is necessary to make Vertical Farming a reality. Typically I don’t read through write-up on blogs and forums, however I want to say that this write up forced me to try and do so! The way with words amazed me. Thanks a bunch, very nice content. I hardly ever leave a comment, however i did some browsing and wound up right here. I must say that’s a good article there. I’d would like to follow anything fresh you have to submit.